"Mangy" is not a term of endearment. While the terms Demodex gatoi and Demodex cati sound sort of exotic, they're just the scientific names for feline mange mites. Of course, if Kitty is diagnosed with mange, you could tell friends he's being treated for a case of "Demodex cati." Sounds much better than "nasty parasites." Mange caused by Demodex gatoi or Demodex cati is known as demodetic mange, or demodicosis. Another common term for it is "red mange," because of its characteristic red bumps. Fortunately, mange isn't that common in cats, although certain breeds are more vulnerable. These include the Siamese and its cousin, the Burmese. Mange mites, too small to be seen with the naked eye, normally live on a cat's skin and cause no harm. Demodex cati reside in Kitty's hair follicles, while Demodex gatoi live in the skin's outer layer. 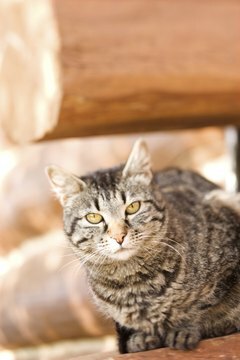 Since cats with compromised immune systems are more likely to suffer from mange, demodicosis usually affects older cats with underlying illnesses. Besides the red bumps that may turn into seeping sores, mange symptoms include constant itching and hair loss. Kitty may lose hair over his entire body, or it might be confined to his neck and head. In any case, he is a very sorry-looking, miserable animal. While feline mange isn't contagious to people, if you pet Kitty and cat mites get on your skin, you might experience a temporary rash. Before treatment begins, the vet will take skin scrapings to find out what kind of mite is causing the symptoms and if an underlying disease is responsible. Cats suffering from mange caused by Demodex cati might have diabetes, cancer or infection with the feline immunodeficiency virus. If the mange is caused by demodex gatoi, there's probably no underlying ailment, but Kitty is much itchier. Other than treating Kitty's primary disease, your vet might recommend lime sulfur dips to rid Kitty of mange mites. She might prescribe the dewormer ivermectin, which also kills mites, along with antibiotics to heal skin infections. Since mange is so contagious, once Kitty returns from the vet you should throw out all her old bedding, toys, litter boxes and dishes and replace them with new ones. Any other cats in your home should also receive dips or baths with miticide shampoo, even if they show no signs of mange. Ask your vet to recommend a good disinfectant to clean any parts of the house to which your cats have access. How to Tell a Norwegian Forest Cat From a Tabby? What Are the Treatments for Demodex Mange on Dogs? What Does It Mean When a Cat Trills?